SatisMeter is a customer feedback tool using the Net Promoter System to reduce churn and accelerate growth. What can SatisMeter + Intercom do? 3. 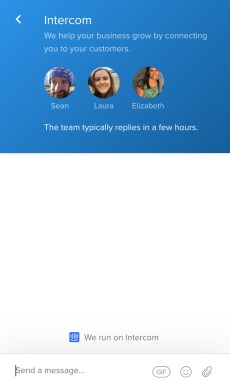 View all your responses within Intercom as events and conversations. 4. 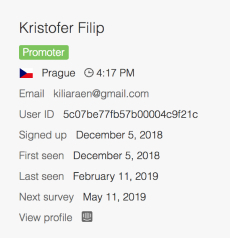 Seamlessly transfer from SatisMeter user profiles to their details in Intercom. Sign up for a SatisMeter free trial. Install SatisMeter either via an existing Segment account or using our HTML snippet. Configure your SatisMeter settings to the channels and timing that works for you. Click the "Connect to Intercom" button in Settings / Integrations / Intercom in SatisMeter. When prompted "SatisMeter wants to connect to your app on Intercom" click Connect. 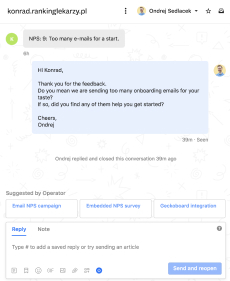 Any verbal feedback you collect via SatisMeter will appear as a new conversation in Intercom, making it easy for you to react and respond. Collect actionable feedback inside mobile & web or via email. Get ~30% response rates. Build a product your customers need. Reduce churn. 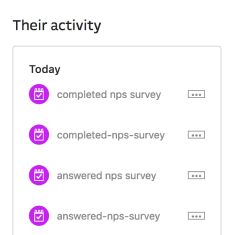 Track NPS® trends.